Prime Minister Stephen Harper says there are no “special loopholes” in Canada’s wireless rules for large foreign companies like Verizon, wading once again into a contentious war of words between his government and the Big Three telecoms. But Harper’s latest salvo comes even as the prospect of Verizon coming to Canada seems more remote than it has in months, as Verizon seems to be distracted by much larger negotiations than a possible entry into Canada. The Big Three wireless companies — Bell, Rogers and Telus — have been running a pressure campaign asking the federal government to rewrite rules they say include a number of “loopholes” that would allow a foreign giant like Verizon to bid on twice as much wireless spectrum as the large established players. 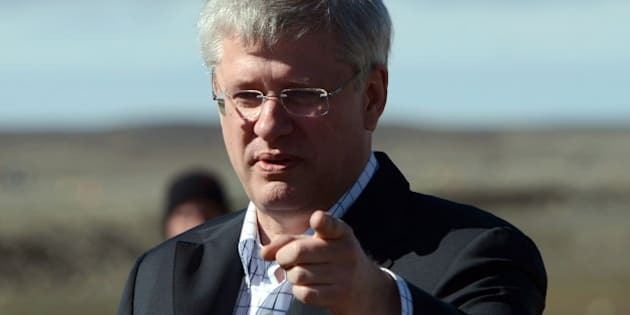 "The reality of the situation here is there is no special rule or special loopholes for foreign companies," Harper said Thursday, as quoted by Reuters. "There are rules that assist all new entrants, whether they be Canadian or foreign, to enter the marketplace and provide competition that will be in the interest of Canadian consumers." But some market observers say the whole debate may be a moot point. Bloomberg News reported Thursday that Verizon is in talks with partner Vodafone, the U.K.-based wireless company, to buy out Vodafone’s stake in Verizon Wireless. The move means Verizon will likely be paying attention to those talks rather than to the upcoming Canadian wireless spectrum auction, for which it would have to submit a deposit by September 17 in order to stay in the game. Vodafone owns 45 per cent of Verizon Wireless, and the U.S. company is reportedly in talks to buy that stake for about $130 billion. Compare that to the $700 million Verizon reportedly offered for Toronto-based Wind Mobile, and you get an idea of how much more important the Vodafone negotiations are to Verizon than entry into the Canadian market. “If negotiations between Verizon and Vodafone are really heating up we believe that the prospects of a Verizon entry into Canadian wireless could decline significantly,” Canaccord Genuity managing director Dvai Ghose said, as quoted at the Globe and Mail. But some analysts see the Verizon-Vodafone talks as making it likelier, not less likely, for Verizon to come to Canada. That’s because the deal through which Vodafone owns 45 per cent of Verizon Wireless prevents Verizon from operating outside the U.S. If Vodafone is bought out, that hurdle would disappear, Macquarie Group analyst Kevin Smithen said, as quoted at the Financial Post. “Controlling 100 per cent of its free cash flow and board seats gives Verizon more strategic flexibility in the future for expansion into Canada as well as content and spectrum deals,” Smithen said. As analysts play they will-they-or-won’t-they game, two of Canada’s largest unions prepared to hold a protest in downtown Toronto on Friday, opposing Verizon’s entry into Canada. The Communications, Energy and Paperworkers (CEP) union and the Canadian Auto Workers, who represent employees in some parts of the telecom sector, say they fear for Canadian jobs if a large, deep-pocketed U.S. wireless company were to set up shop here. And the Financial Post reports that Telus has sued the federal government, challenging the Industry Minister’s ability to set the rules for who can bid in the upcoming 700 mHz wireless spectrum auction. This marks the second lawsuit Telus has launched against the feds in just the past few months, the first one challenging Industry Canada’s decision to prevent Telus from buying Mobilicity’s wireless spectrum.